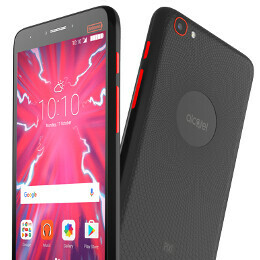 Alcatel recently unveiled a brand new smartphone that's included in the company's Pixi series of devices. Called Alcatel Pixi 4 Plus Power, the new handset is interesting because it's got a very generous 5,000 mAh battery inside. According to Alcatel, the 5,000 mAh battery of the Pixi 4 Plus Power can keep the device alive for up to 2.7 days on a single charge (presumably under normal usage conditions), and should be good enough for up to 14 hours of video streaming. The battery features some sort of quick charging technology, and can act as a power bank so you can charge other devices via microUSB. Impressive battery aside, the Alcatel Pixi 4 Plus Power offers modest features, including a 5.5-inch display with 720 x 1280 pixels, 1 GB of RAM, and 8 GB of expandable storage space. There's no LTE connectivity, but you get dual SIM support. The new handset runs Android 6.0 Marshmallow, and probably uses a MediaTek processor (this hasn't been confirmed yet). Alcatel didn't say when, where, or for how much the Pixi 4 Plus Power will be available, but we're pretty sure that the phone isn't going to be expensive at all. We'll let you know when (and if) the handset is released in the US. First they take away headphone jack then LTE. Next phone might as well have no power button. Always on technology, because we don't give you a way to shut it off. Isn't the headphone jack on the top of the phone? Look closely at picture nr. 6. 1 GB of RAM, and 8 GB of expandable storage space in 2016/2017!!???.. Pass.. I love the huge battery, but this thing won't be usable. It's DOA with only 1 GB of RAM. Why doesn't any manufacturer ever come out with a decent phone with a 5000mah battery?? I want one!